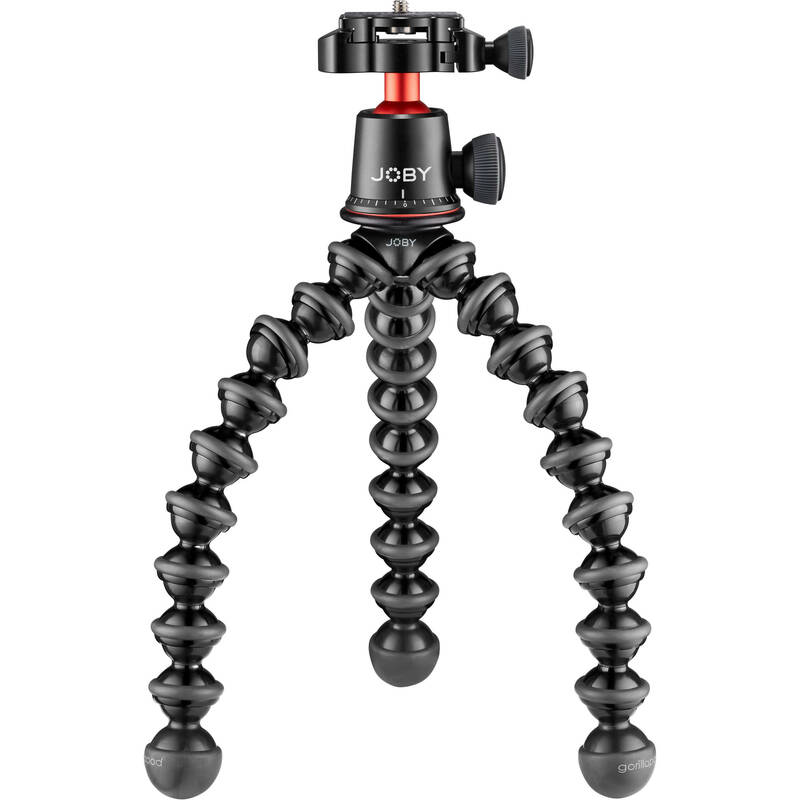 The black, charcoal, and red GorillaPod 3K PRO Kit from Joby is an optimal combination of support designed for videographers and photographers alike. The legs wrap and grip around rails, pipes, or tree branches for that unique angled shot. At the same time, you can have stable support on a flat surface for that one-on-one video interview. The BallHead 3K PRO from Joby is a 6.7-ounce, 3.5"-tall compact support that is Arca-type compatible, and it is ideal to use with smaller mirrorless cameras because of its smaller footprint. The ball head can support strobes, mics, and other photo and video accessories, and it can be mounted via its 1/4"-20 socket onto a bracket or rig. The single locking knob controls both the 90° tilt and the 360° rotation. The black, charcoal, and red colors of the BallHead 3K Pro match the GorillaPod 3K PRO Stand to create an optimal kit. The GorillaPod 3K PRO Stand from Joby, with its anodized aluminum and patented metal socket technology, offers a durable 9.6-ounce stand with a load capacity of 6.6 pounds, ideal for mirrorless cameras and other photo/video accessories. The legs' ball-and-socket construction can wrap and grip securely around pipes, rails, and tree branches for a unique angle while capturing video or photo. At the same time, the stand holds its position on a flat surface, and you can fold it to a length of 9" to use it as a grip for a small digital/video camera. The black and charcoal colors of the stand match the BallHead 3K PRO, which can mount to the stand via its 1/4"-20 mount, to create an optimal kit.